On July 17, groundbreaking was held for an Educational and Visitors Center across the street from the Louis Armstrong House Museum in Corona, Queens, New York. Twenty-three million dollars has been raised to fund construction of the building, which will have a state-of-the-art, multi-media exhibit area; a 72-seat “Jazz Room” where lectures, film screenings and live performances will be held; and a museum store. The entire research collection will be moved over from Queens College and housed on the second floor. The building is expected to be open two years after the start of construction. 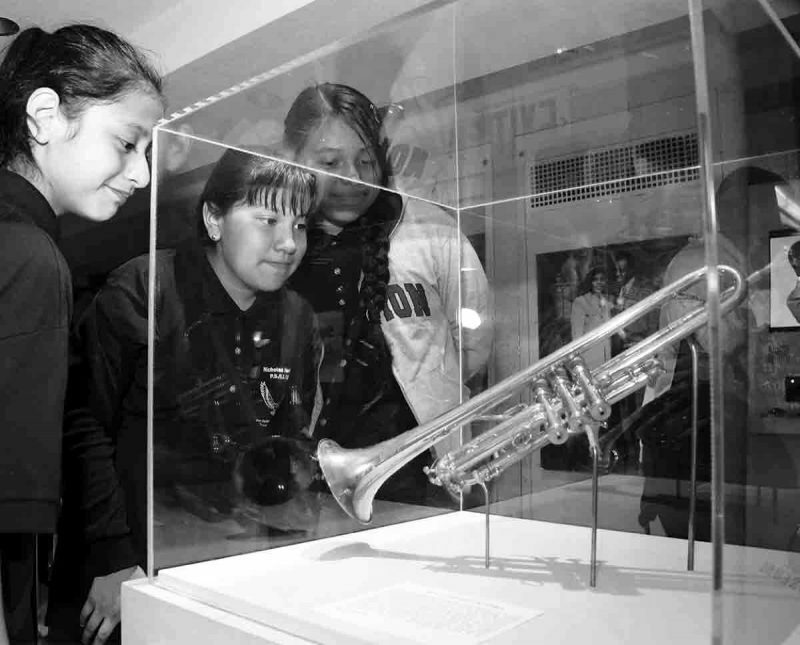 When Michael Cogswell came to Queens College in 1991 to create the Louis Armstrong Archives, he found a treasure trove of American jazz history: 72 cartons of memorabilia, including 5,000 photographs, 100 scrapbooks, 650 home recordings, and five gold-plated trumpets. It took him three years to sort through it all before making it available to scholars, music writers and television producers looking for material on the jazz legend. The Armstrong home was designated a National Historic Landmark in 1977 as well as a New York City landmark, and after a $2 million renovation, it formally opened as a museum in 2003. Following a national search in 2009, Ricky Riccardi, who has a master’s degree in jazz history and research from Rutgers University-Newark and in 2011 authored What a Wonderful World: The Magic of Louis Armstrong’s Later Years, was hired as archivist. Last year, the Museum received a $2.7 million grant from the Robert F. Smith Fund II Foundation to completely digitize the 10 Armstrong research collections, which are currently housed four miles away at Queens College and represent the world’s largest archives for a single jazz musician. This project involved digitizing the contents of over 100 scrapbooks; transferring dozens of rare reel-to-reel tapes, acetate discs and cassettes; and scanning 17,000 photographs, news clippings, sheet music, album jackets, concert programs and letters, all of which will be available for researchers and Armstrong fans on a website by mid-to-late 2018. Education is a big part of the Museum’s mission. Open daily except on Mondays, it is a popular destination for tourists and school groups, with 40-minute tours conducted by volunteer docents. (There is an admission charge.) Researchers and students who are writing about Armstrong make appointments to meet with Riccardi. Concerts, film screenings and lectures that preserve and promote the cultural legacy of Armstrong are held based on space availability. It was on this premise that on her passing in 1983 at age 69, Lucille, who had continued to live in the house, willed the home to the City of New York, which then entered into a lease agreement with Queens College to develop the Louis Armstrong House Museum. A grant from the Armstrong Foundation facilitated the Museum’s acquisition of the world’s largest private collection of Armstrong material from Jack Bradley, a noted jazz photographer and friend of the legendary trumpeter. The Louis Armstrong House Museum is not your typical museum with visitors wandering about wearing earphones and viewing video screens, exhibit cases and static displays. It offers a very personal view of the lifestyle of this jazz icon. Corona is a section of Queens not far from LaGuardia Airport and CITI Field, home of the New York baseball Mets. The house is located on an ordinary, tree-line street in what was a mostly white, middle-class neighborhood when the Armstrongs moved there in 1943. Armstrong knew the value of kindness and generosity, and that made him a beloved figure in the neighborhood. He didn’t want to show off, so he kept the outside of his house simple. The inside of the house was another story, and it remains much as it was when Armstrong was alive. The interior is full of artwork, including a portrait of Armstrong painted by fellow legend Tony Bennett. The living room’s treasures included fragile pieces like a vase from France and a statue from Japan, both gifts from dignitaries, but that didn’t stop Armstrong from having neighborhood kids over to watch TV and eat ice cream in the room after giving them music lessons outside on the stoop. The house has a definite lived-in quality, with worn furniture and rather funky décor such as silver-foil wallpaper. Homemade audio recordings of Louis breathe life into the various rooms. In the dining room, he jokes about Brussels sprouts—not his favorite food. In the wood-paneled office where Armstrong catalogued and stored recordings, many in record sleeves that he decorated with collage art, he is singing “Blueberry Hill.” There is a chairlift to the second floor that Armstrong needed after suffering three heart attacks. The bathrooms are glitzy with marble decking, 24-carat gold-plated fixtures, and mirrors lining the walls and ceiling. The kitchen is 1960s state-of-the-art with turquoise-colored cabinets and a custom-made stovetop and double-oven. A small street-level room features rotating exhibits and one of the five Armstrong trumpets found in the house. The garage serves as a gift shop selling among other things, Swiss Kriss, Louis’s laxative of choice, and boxes of red beans and rice, his favorite dish. Outside is an attractive Japanese-inspired garden where the Armstrongs entertained. “We don’t think that we could be more relaxed and have better neighbors any place else. So we stay put,” Armstrong wrote in an unpublished manuscript found in the home. Visit the Louis Armstrong House online at www.louisarmstronghouse.org.